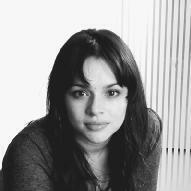 In 2002 Norah Jones, age twenty-two, released her debut full-length album, Come Away with Me. A low-key, acoustic work that defies categorization but includes hints of jazz, traditional pop, country, and folk; the CD is the kind of recording that would ordinarily have sold several thousand copies, earned admiring reviews in the music press, and then faded from view. In the beginning, that is exactly the path the recording seemed to take. But to the surprise of many, including Jones herself, Come Away with Me continued to sell steadily month after month, thanks to outstanding reviews, positive word-of-mouth, and unexpected radio play. It took nearly a year, but eventually the album reached the number-one position on Billboard 's album chart, selling some three million copies over twelve months. By 2004 it had sold eight million copies in the United States and an additional ten million worldwide. Far less well known than her fellow nominees, Jones earned five nominations for Grammy Awards. On February 23, 2003, the night of the 45th Annual Grammy Awards, she went home with an armload of trophies, winning for every category in which she was nominated. Her follow-up album, Feels Like Home, followed a different, steeper path when released in 2004: Jones's second effort shot straight to number one, selling one million copies in its first week alone. "I'm not soft-spoken and romantic, at all. I must be, somewhere deep down, otherwise I wouldn't like that kind of music. But I'm only like that when I'm on stage. I'm pretty much just loudmouthed, obnoxious, and silly." Jones was born in New York City in 1979. Her mother, Sue Jones, is a nurse and music promoter. Her father, Ravi Shankar, is a world-famous musician hailing from India. Shankar became widely known for his association with the Beatles and other Western musicians; he taught Beatles' guitarist George Harrison how to play the sitar, a long-necked Indian stringed instrument, of which Shankar is considered a master. As early as age three, Jones began showing a keen interest in music, closely watching her father when he played his sitar. At age five she began singing in her church choir. She learned to play several instruments in her youth, primarily studying piano. Shankar and Sue Jones, unmarried when Norah was born, separated when she was still a young child. Sue took her daughter to live in Texas in a suburb of Dallas called Grapevine. Jones lived there for much of her childhood, having no contact with her famous father for ten years. Her musical influences during that time came from her mother's record collection. She felt especially affected by the works of great jazz, soul, and blues singers, including Etta James, Aretha Franklin, and Billie Holiday. Jones also spent countless hours listening to recordings of musicals such as Cats and West Side Story. Norah Jones's surprising success with a style of music that generally doesn't reach the top of the Billboard charts has paved the way for similar artists, performers who now see the potential for widespread success with their more traditional musical styles, and whose labels are now more willing to invest in their music. One such performer, Britain's Jamie Cullum, has crafted a jazz-influenced style for his singing and piano playing, a blend of old-time pop standards and cabaret-style jazz with the occasional rock tune thrown in for good measure. With Twentysomething, Cullum has taken his native country by storm, selling more records than any other jazz artist in United Kingdom history, and outselling a number of major pop acts as well. He made a splash in the United States when his album was released there in 2004, with many critics comparing his swinging style to that of Norah Jones and Harry Connick Jr., and to the croonings of another famous performer, the late Frank Sinatra. Just twenty-three years old at the time of his 2003 U.K. release of Twentysomething, Cullum took his newfound fame in stride, considering it the result of many years of working hard and paying dues. He has been playing guitar and piano since age eight, and he began playing for audiences in clubs and bars at about age fifteen. Encouraged in his love of jazz by his older brother, Ben, Cullum grew up admiring jazz greats Oscar Peterson and Dave Brubeck. In an interview with WWD magazine, he related that he was also heavily influenced by other types of music: "I grew up listening to Public Enemy and Kurt Cobain and the Beastie Boys and Guns N' Roses. That's really the influence that pervades what I do." He studied film and English literature at Reading University in England, releasing his first album, as the Jamie Cullum Trio, at age nineteen. His second release, Pointless Nostalgic, earned considerable airplay on British radio and earned him a dedicated fan base. The success of that album sparked a bidding war among record labels, with Universal Records winning out. Still in his early twenties, Cullum was signed to a multi-album deal worth over one million dollars. Cullum has attracted attention for more than just his recorded music: his live performances indicate a young man with over-the-top showmanship. He does more than just play the piano: he bangs on it with his fists, pounds the keys, and occasionally kicks the keys for additional emphasis. When asked by WWD about his exuberant style, Cullum replied: "It's a very spontaneous thing. I just let myself go at the expense of looking like an idiot all the time and getting really hot and sweaty and not being very classy." While some reviewers have criticized Cullum for lacking subtlety, others have praised his boundless energy onstage and applauded his efforts to bring lighthearted fun to music that is usually played with a more serious tone. During her high school years at Dallas's Booker T. Washington School for the Performing and Visual Arts, Jones explored her developing passion for jazz. On her sixteenth birthday she gave her first solo performance, singing and playing piano at a coffeehouse on open-mic night, when anyone brave enough can try his or her hand at performing for the public. During that period Jones also played in a band called Laszlo and tried her hand at composing jazz tunes. She earned recognition from the highly respected jazz magazine Down Beat, winning their Student Music Award (SMA) for Best Jazz Vocalist two years running and also winning an SMA for Best Original Composition. After graduating from high school Jones enrolled at the University of North Texas. She spent two years there, studying jazz piano and giving solo performances at a local restaurant on weekends. She also became reacquainted with her father, and the two developed a close relationship. The summer after her sophomore year Jones decided to head to New York City and try her luck making it as a musician there. Working in a restaurant during the day and performing in downtown clubs by night, Jones felt excited to be part of the city's jazz scene, rather than just studying music in a classroom. She decided to stay in New York, forming a jazz trio, and also performing with other jazz groups, including the Peter Malick Group. While her professional life revolved mainly around jazz, she began listening often to country music. She told Texas Monthly, "It's funny, but I got into country music when I moved to New York. I was homesick, so I listened to [renowned country singer-songwriter] Townes Van Zandt." She created a demo recording of her solo work to send to record labels in the hope of getting a deal, but after a year of passing her demo around with no success, she began to feel discouraged. On the evening of her twenty-first birthday, Jones gave a performance that connected deeply with a notable member of her audience. Shell White, an employee in the accounting department of the revered jazz label Blue Note, was so struck by Jones's talents that she arranged for a meeting between the young singer and the label's chief executive officer (CEO), Bruce Lundvall. After meeting Jones and hearing her sing, Lundvall signed her to a record deal on the spot. Lundvall explained to Time magazine's Josh Tyrangiel that such impulsive decisions had been made only twice in his career at Blue Note (the other artist was jazz vocalist Rachelle Ferrell). Lundvall described the essence of Jones's appeal: "Norah doesn't have one of those over-the-top instruments. It's just a signature voice, right from the heart to you. When you're lucky enough to hear that, you don't hesitate. You sign it." Jones began her relationship with Blue Note by releasing a six-song EP, a less-than-full-length recording, called First Sessions. This CD includes several songs that later showed up on Come Away with Me. For her debut full-length recording, Blue Note paired Jones with veteran producer Arif Mardin, who had worked with such legendary performers as Aretha Franklin and Dusty Springfield. When she and Mardin began recording Come Away with Me in May of 2001, Jones showed a preference for a spontaneous style in the studio, aiming to capture the intimate and natural qualities of live performance. She recorded fourteen songs for her debut; Jones wrote a few of the tracks but left most of the composing duties to others, including her boyfriend, bassist Lee Alexander, and New York–based songwriter-guitarist Jesse Harris. She also recorded two songs made famous by musicians legendary in their respective fields: country king Hank Williams ("Cold, Cold Heart") and revered jazz-pop composer Hoagy Carmichael ("The Nearness of You"). Released in early 2002, Come Away with Me earned positive reviews. Music critics expressed appreciation for her distinctive voice and authentic, understated style. Many critics wrote of Jones as a promising new artist, a refreshing change of pace from the slick packaging of pop stars like Britney Spears. Even the most admiring reviewers, however, did not predict that the album would gradually become a smash hit and that Jones would become Blue Note's best-selling artist ever. Come Away with Me became so successful that it seemed to be everywhere: on the radio, on television, playing over the public address system in shopping malls. Jones recalled to Tyrangiel that she heard one of the album's tracks in an unexpected place: "Once on a plane—you know how they play elevator music before you take off?—they played one of the songs." The album's exposure became so great that a small backlash arose, with some music journalists declaring that the attention was nothing but hype, and criticizing Jones's music as bland and boring. Some even started calling her "Snorah Jones," a nickname Jones found amusing rather than hurtful. She confided to Tyrangiel, "My mom calls me Snorah all the time now." 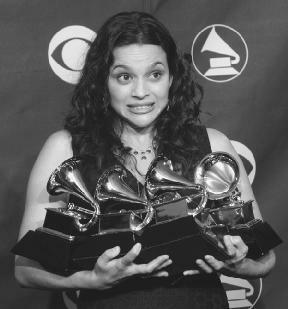 Norah Jones holds her five Grammy Awards. in February of 2003. The album won all eight awards for which it was nominated, with Jones receiving five awards and the three others going to producer Mardin, the album's engineers, and songwriter Jesse Harris for "Don't Know Why." Among Jones's victories were trophies for Album of the Year and Best New Artist. As the ceremony progressed, Jones began to feel overwhelmed, as she related in Texas Monthly: "I felt like I was in high school and all the popular kids were in the audience and were, like, 'What's she doing up there?' I felt like I had gone in a birthday party and eaten all the cake before anyone else got a piece." Some aspects of her newfound fame pleased her, especially the positive reception from most critics and her increased ability to control the direction of her career. But for the most part Jones retreated from the spotlight. She preferred the idea of being a member of a group rather than a solo star, telling Billboard 's Melinda Newman, "Deep down, in my gut, all I want to be is part of a band." In the beginning, she didn't feel entirely comfortable performing in concert, making music videos, or talking to the press. Jones sought a quiet lifestyle, unexpected for such a young musician, preferring low-key get-togethers with her bandmates to late-night partying at clubs. When work began on a follow-up album, Feels Like Home, many music-industry insiders speculated that it would take a miracle for the second album to sell as well as the first. Such predictions did not faze Jones. Her primary focus was the music; she was eager to branch out on her second album and explore different styles, having shifted away from jazz and toward country in her listening habits and writing. For Feels Like Home, Jones took a greater role in the songs' composition, writing or cowriting six of the album's thirteen tracks. The album was recorded after a series of collaborative sessions with bandmates, with each member contributing to various aspects of the project. Guest artists included country-music mainstay Dolly Parton and, from the influential rock group the Band, Levon Helm and Garth Hudson. After the phenomenal success of her debut, people throughout the industry—record label executives, music retailers, and journalists—as well as millions of fans eagerly anticipated Jones's follow-up. Released in early 2004, Feels Like Home was snapped up by one million buyers in its first week, resulting in an instant rise to the numberone position on Billboard 's album chart. Determined to let her second album's reception happen somewhat naturally, Jones pressured Blue Note to devise an understated publicity campaign that wouldn't blanket the television and radio airwaves with commercials for Feels Like Home. Blue Note CEO Lundvall told Billboard 's Newman, "We're not hyping the record. We're not going out there and advertising all over the world." For her part, Jones remained calm under the intense pressure of following up a debut album that had sold more than eighteen million copies worldwide. She related in Texas Monthly: "It's funny, but I don't want to know about sales. I don't want to read any of the reviews; I don't want to see any of the articles. I just want to do what I do and have it be as unfussed-with as possible." Music reviewers varied in their responses to Feels Like Home. Some expressed a wish that Jones would break out of her mellow approach and make edgier music. David Browne of Entertainment Weekly concluded that "Jones' voice conveys warmth and contentment but little in the way of urgency or intensity." Others felt that she had failed to commit to a specific style, instead sampling from a variety of genres. A few complained that Jones had written or chosen too many mediocre songs, relying on her lush vocals to overcome any writing shortcomings. But numerous critics found plenty to love in Jones's second release. Tom Moon wrote in RollingStone.com, "Far from blanded-out background music, Feels Like Home ... is a triumph of the low-key, at once easygoing and poignant." Matt Collar wrote for All Music Guide that, with Feels Like Home, "You've got an album so blessed with superb songwriting that Jones' vocals almost push the line into too much of a good thing." At the PopMatters web site, Ari Levenfeld wrote: "While many critics of the album complain about the slow pace of the music, relegating it to little more than background music, it's hard to believe that they were paying attention. There simply isn't another singer working in pop music now that holds a candle to Jones." Millions of fans seemed to agree with Levenfeld's assessment, finding Jones to be a breath of fresh air in a stale pop landscape. She is a musician who has sought success but not necessarily stardom, and who seems more likely to share the spotlight than grab it for herself. At a time when young pop singers belt out every note with over-the-top passion, Jones opts for subtlety, understanding that a low-key voice stripped to its essence can pack a greater punch than one bellowed out at top volume. Tyrangiel explained, "She never fails to choose simple over flamboyant, never holds a note too long. She may prove to be the most natural singer of her generation." Browne, David. "Falling in Lull Again." Entertainment Weekly (February 13, 2004): p. 70. Burwell, Alison. "The Jazz Singer." WWD (May 11, 2004): p. 4. Jones, Norah. "No Fuss." Texas Monthly (April 2004): p. 60. Moon, Tom. "As 2nd CD Is Released, Norah Jones Fights for Control of Her Image." Knight Ridder/Tribune News Service (February 11, 2004): p. K4996. Newman, Melinda. "Norah Jones." Billboard (January 31, 2004): p. 1. Patterson, Troy. "No Place Like Home." Entertainment Weekly (February 20, 2004): p. 34. Tyrangiel, Josh. "Come Away Again." Time (February 9, 2004): p. 64. Tyrangiel, Josh. "Jazzed about Ms. Jones." Time (March 18, 2002): p. 84. Willman, Chris. "Norah Jones." Entertainment Weekly (December 20, 2002): p. 36. "The Complete Norah Jones." RollingStone.com. http://www.rollingstone.com/?searchtype=RSArtist&query=norah%20jones (accessed on June 21, 2004). Levenfeld, Ari. "Norah Jones Hangs Her Hat." PopMatters. http://www.popmatters.com/music/reviews/j/jonesnorah-feelslike.shtml (accessed on June 21, 2004). "Norah Jones." All Music Guide. http://www.allmusic.com (accessed on June 21, 2004).